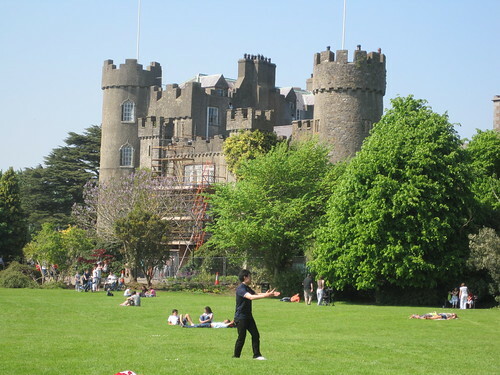 I’ll be honest – Malahide Castle was disappointing. After getting off the DART, I saw a really cool spire on top of what I soon found was a church, and not the castle. I should have known better than to think the train would have just dumped us off right in front a castle. None of us knew where we were going, so imagine a group of around 30 students walking up and down a narrow sidewalk outside the train station. I felt like an idiot wandering around, so I asked a guy if he knew how to get to the castle. He did, and we went back the original way we were headed. I didn’t remember reading about this castle in the book, so I was just along for the ride today to see what adventure would come about. We walked for what seemed like forever into a giant forest, past fields of people playing football (soccer) and cricket, and a playground with a gargantuan slide at the center that I really wanted to slide down. When we finally arrived at the castle after snaking through about 20 minutes of paths inside this large park, my first thought was, “That’s it?” When I think of castles, I think of grandiose buildings that are stories tall and surrounded by a moat. This building was maybe two large or three regular stories tall and covered in front by scaffolding and construction gates. Perhaps if I’d done more research prior to going, I would have known what I was getting into and not been so let down by the façade. I thought, “Okay, so it isn’t that big, but maybe it has some sweet history behind it, and this lady is going to tell us everything we need to know.” She introduced the castle using a memorized script, before saying we would be guided by narrated tracks on speakers I’m sure the owners had during their stay. I must’ve zoned out during the first few minutes because I didn’t hear anything I thought was that interesting. The castle was owned by the Catholic Talbot family and, from what I can gather, is probably most famous for its intricate carvings along walls and ceiling, as well as on various pieces of furniture. It was very crafty of the architect to only build windows in one side of the wall for defensive purposes, and the walls were up to eight feet thick in some places. The rooms, brought to us by pre-recorded narrators, were drawing rooms where guests visited. I’m not sure why they called them drawing rooms, since I saw no easels, but it may be because they drew guests to these rooms when they hosted gatherings. After three of these rooms, the lady from before directed us upstairs. As we walked around the top looking at bedrooms and various furnishings, as well as other artifacts, I kept trying to solve two questions almost that didn’t really have to do with what I was looking at. One – how does a family become rich enough to own a castle? And two – how come the audio narration ran out after only three tracks? I couldn’t solve my first question. But with regard to the narration, my answer may have been met by a tidbit the lady told us when going upstairs. While pointing to a portrait of two young Talbots with an adult – presumably a parent – she mentioned the little girl in the picture was the last member of the family to ever live in the castle. 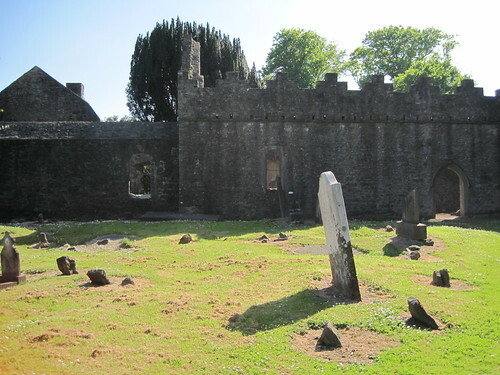 According to our lector, the little girl, whose name was Rose, wound up living until 2009 in New Zealand, but had to sell the castle in the 1970s because the taxes were too high. Assuming the Talbots did, in fact, live with speakers in their house, perhaps the taxes were too much for Rose to pay and she had to stop the narration project for the upstairs rooms. Of course, it’s a ludicrous idea. But it’s the only halfway feasible answer I can come up with. I wonder if the Talbots enjoyed their tourist restaurant that was at the bottom of the stairs, too. This day will never end. I woke up at 7:30 a.m. on Thursday morning. The idea behind getting up early was to be tired enough to sleep on the plane. Unfortunately, I got ahead of myself and could barely stay awake on the ride to O’Hare. But while I was on the plane, I couldn’t sleep fully. What should have been a fantastic seven-hour sleep cycle before heading out into Dublin for the first time just wasn’t meant to be. It all started with the lady who checked my bags in Chicago. She sold me on switching to a window seat instead of the aisle seat. It’ll be perfect if you want to sleep, she said, because nobody will need to get up and get out. It turned out I needed to get up the most out of the three of us in my aisle. The women I sat next to didn’t feel like getting up when I had to leave my seat, and were surprisingly okay with letting a complete stranger crawl all over them. When I was closest to falling asleep, one of the kind – or not so kind, depending on how one looks at it – women sitting next to me tapped me on the shoulder for dinner. After choosing chicken and pasta over whatever the other option was, I thanked her for waking me up because I hadn’t eaten much in about nine hours. Unfortunately, she tapped me to render a decision every time after that. A box with unknown contents that I would soon discover was breakfast? I wasn’t really in the eating mood at that point. I got my best “sleep” on the descent, of all times. At least three separate dreams entered my head between the time the pilot told us we needed to hold because of the fog and when he finally said we’d be down. I asked Gabby inside Dublin International Airport how much time passed between then, and she said not much. We arrived in Dublin about a half hour late. I kept asking Gabby and my roommate Dylan if it was time to go to sleep yet, but it was only around 9:15 a.m. in Dublin. Accounting for the time change, that means I’d been awake for about 20 hours, and I never stay awake that long. 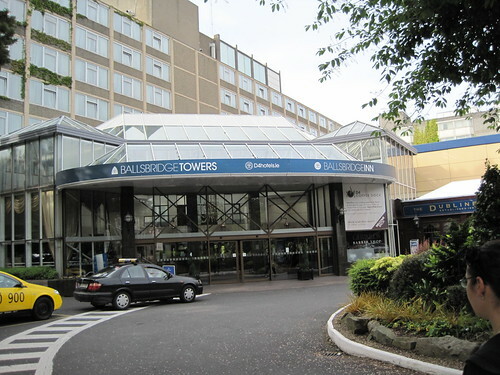 I was excited to take a little downtime at the Ballsbridge Inn after the flight, but Bradley faculty were having none of that, assembling their crews around an hour after checking in to head out on the DART, Dublin’s local rail system similar to Chicago’s CTA. 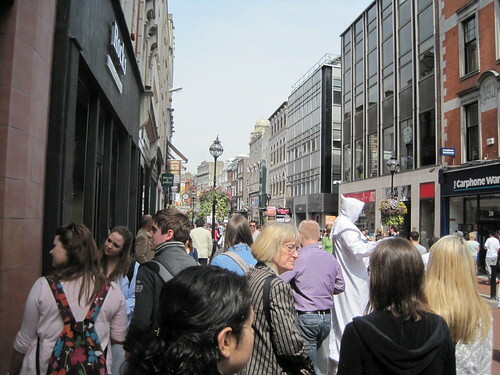 We took this to City Centre, where we walked in and out of a few stores to learn a little about the area before getting lunch at St. Stephen’s Shopping Centre. It was one of the first times I actually felt hungry since eating dinner. 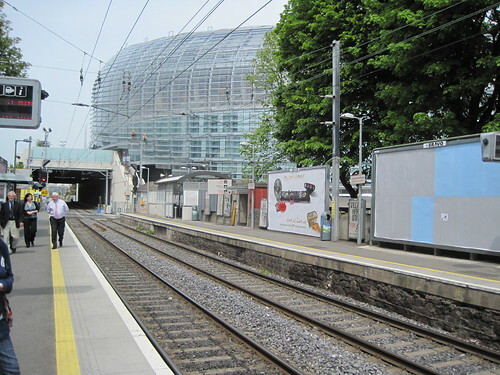 After that, we walked down to catch the bus back to Ballsbridge, where I hung out and took a much-needed shower. I lied down on the bed to watch The Simpsons, since I hadn’t seen it for so long, but I didn’t even make it to the commercial before konking out. When I woke up, I realized it was only 7 p.m. local time. It’s 10:15 local time right now and the sun has set, but it is still not totally dark. That’s just one more facet to my already messed-up day that has now stretched into two days. Thankfully, I can sleep soon. I’ve really thought about three areas for my personal interest. The first would be looking at churches. I’m not sure, at this point, what direction would I take this. I could compare and contrast parishioners’ use of churches from today back to a certain period. The majority of places I wrote down on my initial list were churches and cathedrals. These religious facilities always boast amazing architecture, and the ones in the Eyewitness Travel guide seemed to be full of history. Perhaps instead of looking at the use of the buildings, I could look at how they were constructed and note similarities and differences across time and location. Another idea I had was to look at the Jameson Distillery and the Guinness Storehouse. With all of the stereotypical attitudes towards Irish drinking, I might analyze how the Irish view themselves in relation to other countries. In other words, do the Irish really drink as much as we Americans perceive them to? If I actually had a pint for all the people that have told me to have a pint of Guinness for them, I might as well not even board the plane for Dublin because I’d violate the alcohol policy so many times over. As of this writing, I abstain from drinking. But I have a lot of college counterparts who I feel could rival an Irish drinker any day of the week. Regardless, I think this is a topic worth a brief study. My last interest would be looking at martial arts in another country. It’s not listed anywhere in the packet or that I noticed in the guide, but I think that’s a good thing. I’ve been involved with Metamora Martial Arts for almost seven years, having been to dozens of tournaments and presented seminars and demonstrations all over the tri-country area. While I can’t speak for all schools, I have a general idea of what is expected in American karate schools. I’m curious to find out how they are taught in Ireland, and how that might compare or contrast to how they are taught in the United States. Even here, even within the same school, different instructors expect different levels of performance from their students. I’ve found a few schools in Dublin, and my guess is that Wild Geese Martial Arts is nearest to our hotel. If nothing else, I’d at least like to watch a class somewhere and get some information out of it. With that, I think I have solid leads on picking a special interest for my second essay in Dublin. In 48 hours, I will be riding with my friend Gabby and her parents en route to Chicago before flying out of O’Hare on our flight to Dublin. I’m honestly not sure how to feel about going overseas. My spring semester ended later than everybody else’s, at 5:30 a.m. this past Saturday morning after spending the night in GCC 205 to complete a group project. I admit to not even working on it the whole time, as I took an hour and fell asleep on the floor while several others completed various tasks. Even though I wasn’t sure I’d have a grade yet when I drove home, I knew when I was getting closer to my house around 6 a.m. that my semester would be over soon because Alice Cooper’s classic, “School’s Out for Summer,” came on. Though fatigued, I couldn’t turn the volume knob to the right fast enough. It was a poetic end to the semester from hell. But it still didn’t ring true entirely, since I’m technically taking two summer courses – ENG 300 in Dublin and THE 131 online in Summer II. I don’t think the reality of the situation has hit yet. I don’t like to think of abstract ideas. I want to be able to see something happen, really witness a change. I’ve only been on an airplane once, only been separated from my family once, and usually the only time I cross a body of water is when I need soar across the Illinois River to drive to Peoria. Based on that, it’s hard to believe that all this is happening. Like all things, I’m not too worried about this adventure. I don’t fear for my safety nor do I fret about the plumes of ash rising out of that volcano in Iceland. At this point, my biggest concern is packing two weeks’ worth of my life into a suitcase and a carry-on. If this is some kind of dream, though, I would really like my money back.